Finding a suitable job in itself is a tough task. However, once you ace the interview and finally get an offer letter, you have to act like a professional and send a perfect job acceptance letter across to your employer. This is easier said than done. Your letter will reflect your personality which is why you need to write it to perfection. 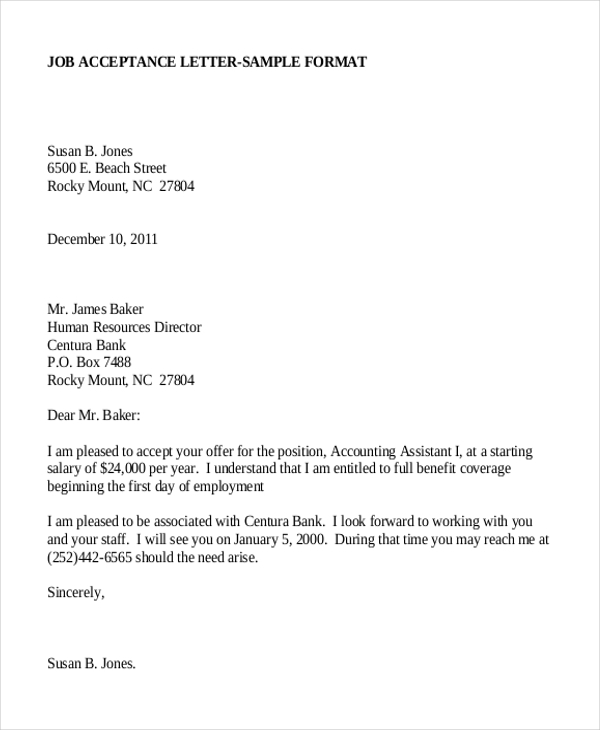 Taking some cue from Sample Letters of job acceptance can surely help. If you are happy with the offer that your prospective employer has made a post that you may have applied for, you need to send him a proper acceptance letter. The aforesaid letter gives you an idea of how to write such a letter. 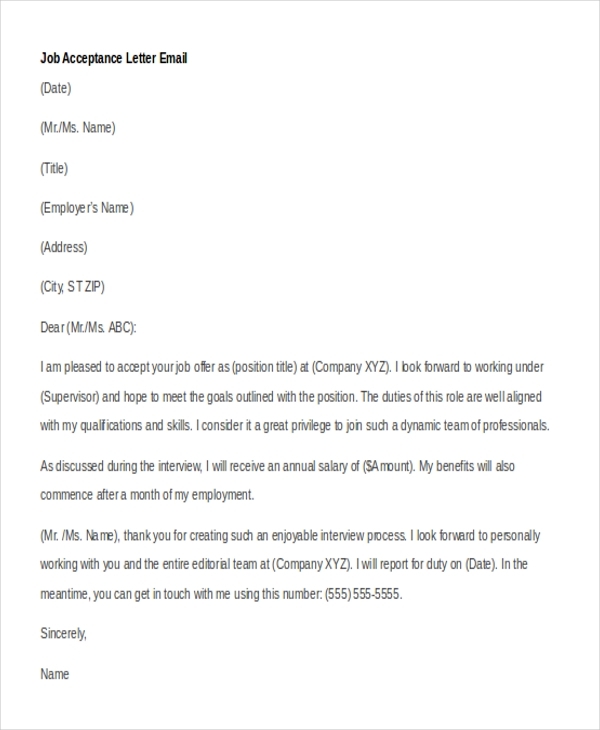 This is a sample of a job acceptance letter that gives you an idea of the format to follow and the right way to frame the sentences that will give the letter a professional touch. You can further make changes to the letter as per your needs. In case you are thinking of sending the job acceptance letter via the email, then the aforesaid letter can give enough cues as to the format of the email and the information to be included in it. 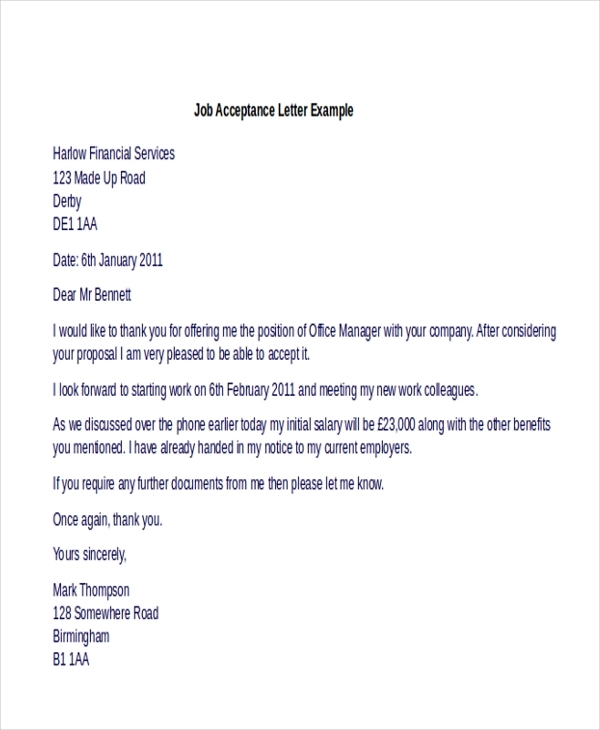 This is an example of a job acceptance letter which gives you a clear idea of the format of the letter and the sections to be included while drafting it. However, you can make changes to this letter as per your needs. You can also see Recommendation Letters. When joining a new organization, it is important that you send the company a formal acceptance letter. In case you need some help in drafting such a letter, get some help from this sample letter that has been designed by professionals. Don’t have any idea of the format to follow when writing a job acceptance letter? Don’t worry. This letter follows the acceptable format and will help you writing a perfect job acceptance letter within no time. 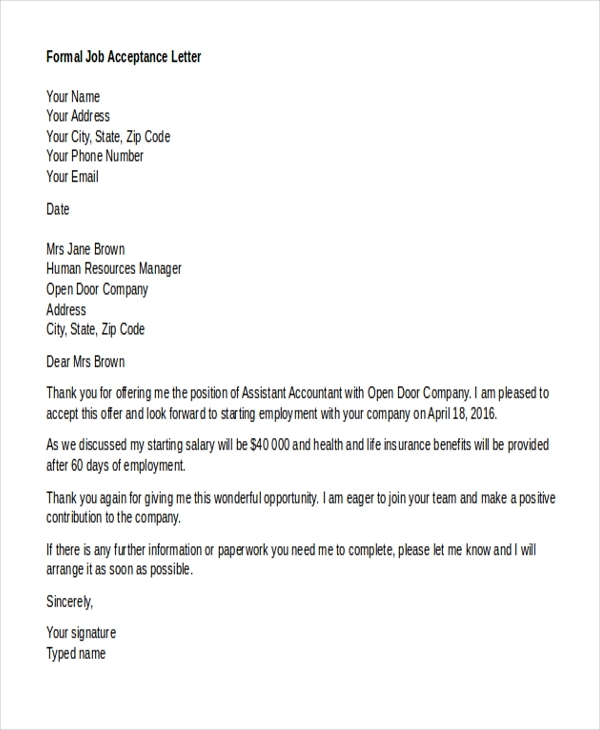 If you are happy with the job offer made by a company and are thinking of sending your acceptance in writing, then this letter will come in handy. With a perfect format and content in place, writing a professional acceptance letter becomes a simple task. You can also see Termination Letters. What are the Benefits of Using Job Acceptance Letters? 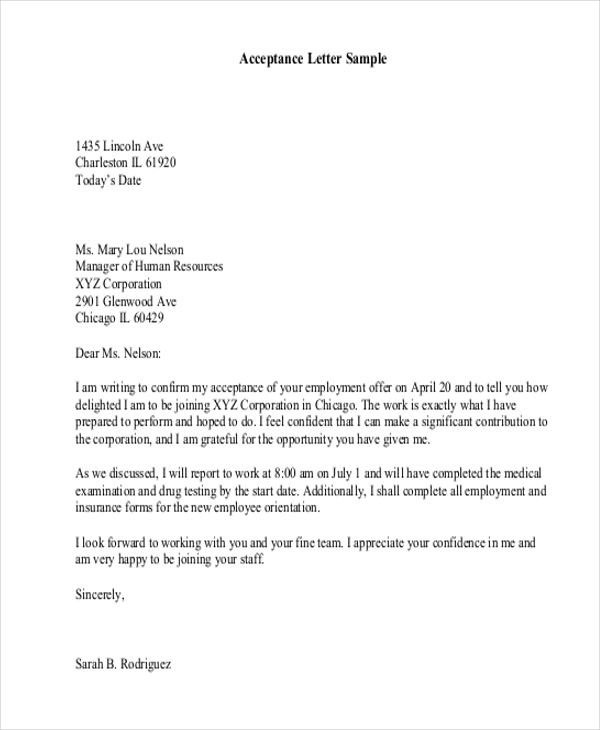 In case you need help in writing a professional looking job acceptance letter, check out our collection of Formal Letters. With a vast number of these available, finding the one that will be perfect for you is possible. 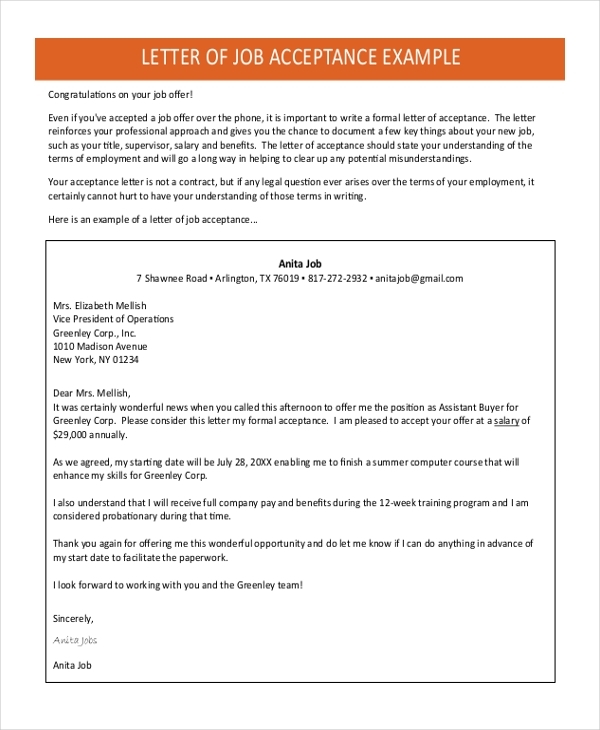 Easy to download and customize, this letter will help you come up with a perfect job acceptance letter with little effort and that too in a short time. You can also see Sample Reference Letters.